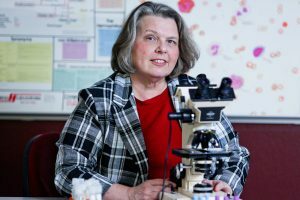 Jeanne Isabel, program director and associate professor for Medical Laboratory Sciences, said it was an honor to receive NIU’s Excellence in Undergraduate Teaching Award. The fact that the award comes from her students makes it twice the honor. Isabel earned her bachelor’s degree from NIU, and went on to earn her master’s degree and doctorate degree from NIU. She joined NIU as a faculty member in 1989. She said her passion comes from the students, who are consistently enthusiastic and wanting to learn. Isabel is lauded for getting to know her students on an individual basis and for challenging them to step out of their comfort zones. Isabel actively works with students and prepares them to be leaders in the field. She takes advantage of faculty development workshops, attends the American Society for Clinical Laboratory Sciences-Clinical Laboratory Educator’s Conference regularly and shepherds curricular changes to stay current in an ever-changing field. In addition, Isabel pioneered an annual study abroad program in Belize that introduces students to the interdisciplinary approach to healthcare services while exploring the customs of the indigenous population. Isabel was also recognized by the College of Health and Human Sciences with the Langford Award for Teaching.